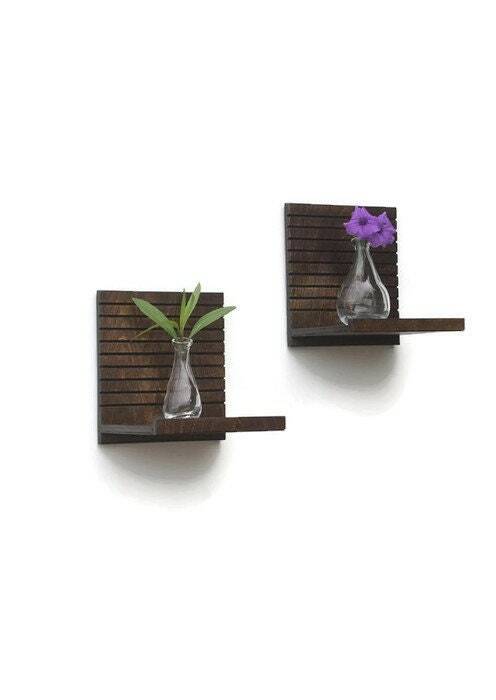 These modern floating shelves hang easily on the wall utilizing two keyhole hangers for a sturdy attachment. An additional feature is added to the back of each shelf to ensure an even interface between the product and your wall. 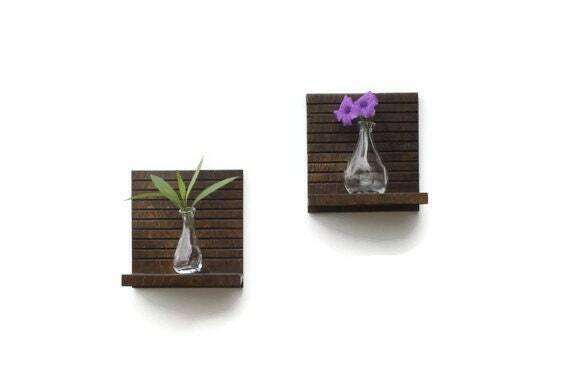 As a courtesy, wall anchors and screws are provided so that you can hang and enjoy your wood shelves the day they arrive! *This listing is for a pair of shelves. Please select quantity of "1" for each pair. • Color: Please choose your stain color preference from the drop down menu and color swatch image. (Espresso Stain pictured here). Shelves are finished with a modern matte clear coat. *Not recommended for items heavier than 1 lb. *Please be advised that wood grains vary from product to product. Each wood shelf is handcrafted with strong joints and made of wood artfully hand tooled in a pattern of repeating horizontal lines. 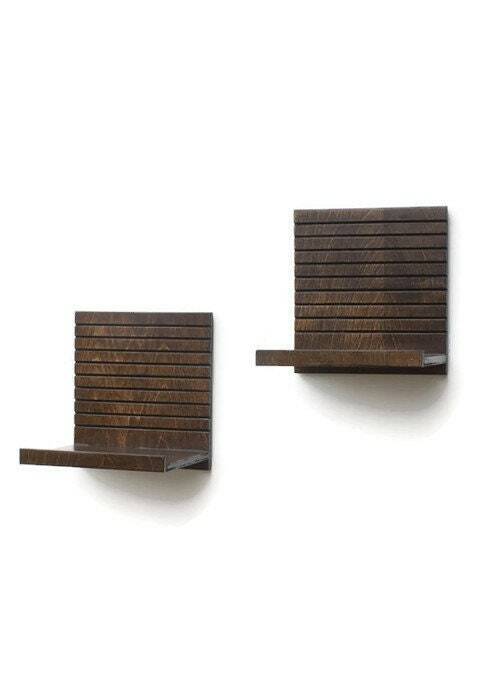 The products are easy to install using two sturdy keyhole hangers mounted on the back of each wood shelf. Your order will come with screws and wall anchors. 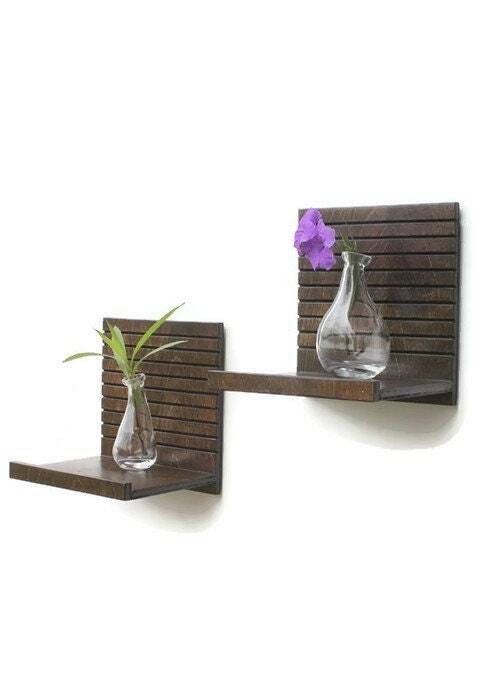 • Your floating shelves ship via USPS in 5-7 business days following receipt of payment. • Custom items ship 7-10 business days following receipt of payment, and are final sale. *Please feel free to convo us about custom orders and colors. **Prior to purchasing, please visit our Shipping & Policies page for additional information. *For your convenience, we accept PayPal, credit cards, debit cards, Google Wallet, Apple Pay, some bank transfer services and Etsy gift cards through Etsy Direct Checkout. *We are required to charge 7% sales tax to our Florida buyers. *Etsy collects sales tax for items shipped to customers in Pennsylvania, Washington and Minnesota. Thank you for your purchase! We appreciate your business! * Please note that shipping times with USPS/FedEx may be longer than normal during the holiday season. MOST ITEMS ship 5-7 business days following receipt of payment (see individual listings for details). Currently, we ship within the United States and to Puerto Rico. CUSTOM ITEMS ship 7-10 days following receipt of payment. **Please note that these are our processing times, and all of our items are made to order. Processing times do not include shipping time/days in transit. *If your order is a gift, please let us know in the "note to seller" area during checkout. We typically include an invoice in all packages (with pricing and shipping costs), but will leave this out in such a case. We are also happy to include a complimentary handwritten note - just let us know! *Buyers local to Melbourne, FL, please convo us before purchasing to discuss delivery options! *Please ensure that you enter the correct address for order shipment, as that is the location to where your products will be shipped. Unfortunately, we cannot refund shipping costs or orders shipped to an incorrect address entered during checkout. *We are not responsible for items lost or stolen from your doorstep. Please contact us about purchasing shipping insurance information, if this is a concern. *We are unable to refund original shipping fees on returns. Buyers are responsible for return shipping costs. Items must be returned in their original packaging. Please make certain to repackage return items carefully, as to avoid sustaining damage during transit. If the item is not returned in its original condition, a refund will not be issued. Please contact us if you have any problems with your order. *All of our products are made to order. *Great care and attention to detail go into describing our products, and images found within each listing are examples of our handmade items. 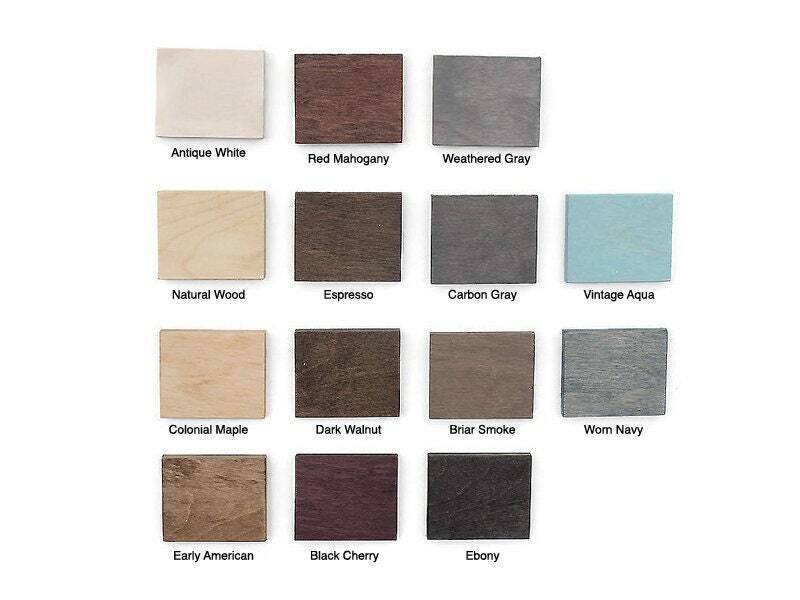 Our products are made primarily of wood, which varies in color, grain and texture. As such, each piece may absorb stain, paint and any finishing material variant from the next, even within the same species of wood. Please contact us with any questions. We love talking about and describing our wares! **Please keep in mind that all computer monitors and mobile devices are different, and colors and finishes may appear slightly varied in person as opposed to on your screen. Please contact us with any questions. We LOVE creating custom and personalized products! Please convo us and let us know what you'd like! See something you like but would like it in a different size, color or variation? Strike up a convo and let us know your preferences. While we do not provide gift wrapping and packaging at this time, we're happy to include a handwritten note with your order. Just let us know the details in the "note to seller" area during checkout! Many of our products are available for wholesale purchase. Please convo us to learn more!